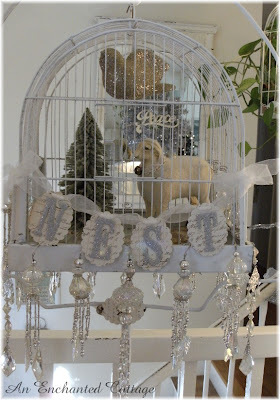 ...and I put one of my favorite flocked bottlebrush trees into his cage. 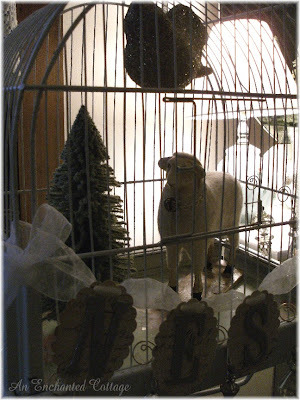 I think he looks very happy in his vintage cage... maybe even a hint of a smile? I picked up these dangly ornaments, discounted by 75%, at AC Moore this past January. At the time, I wasn't sure where I would use them, but 75% off was too good to pass up! 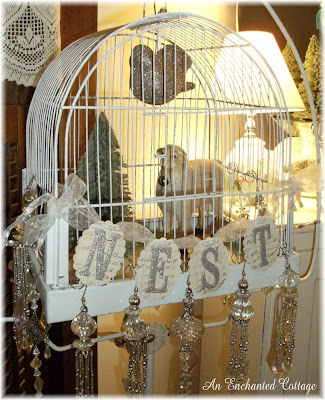 And this year, when I started decorating the cage, it seemed like a good place to hang them. Wishing all of you sweet and sparkly dreams! 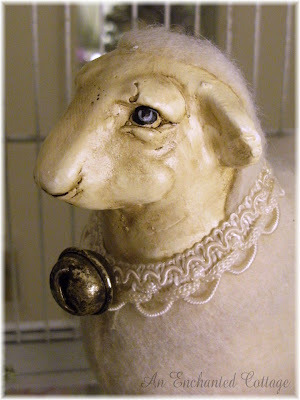 That sheep is sooo cute!! Are you going to enter my door contest? Hurry and send me your photo. Aw, sweet little lamb. 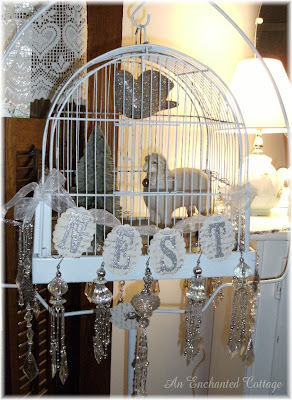 Love the cage too and the bling. You can't go wrong with AC Moores. Did you love the weekend's snow? It looks gorgeous! 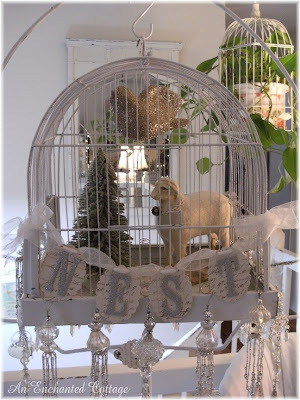 I love the way you displayed this sweet little lamb in the birdcage, with the Christmas tree and birdies...so sweet! Love your header photo...if that's your house, its gorgeous!!! 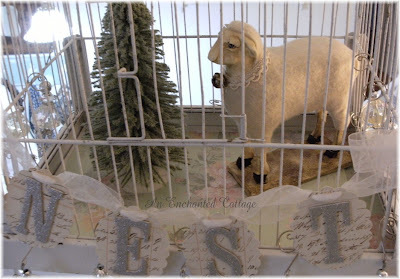 Hello Donna; I just love what you did with the bird cage,, it is so beautiful.. how at home your sweet sheep looks... thank you for sharing it with us... have a great week. 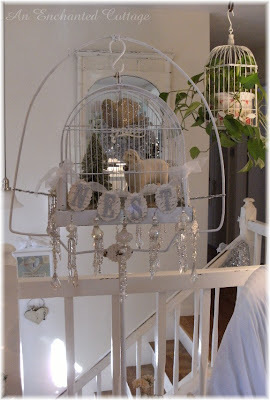 Your bird cage is quite enchanting. I do believe your sheep is very happy in there, I would be if I were him. Blessings! Very nice I just started this bloging and trying to get some followers Fun post. 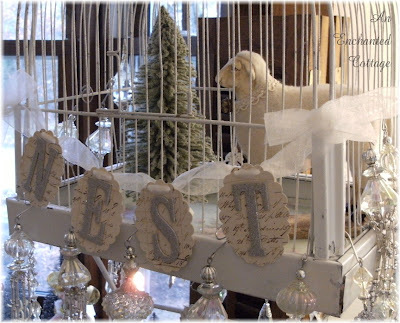 So pretty.... and I love love your blog banner; it speaks of cozyness and warmth and everything homey.... just lovely! awwww......I knew he was going to the best home ever! 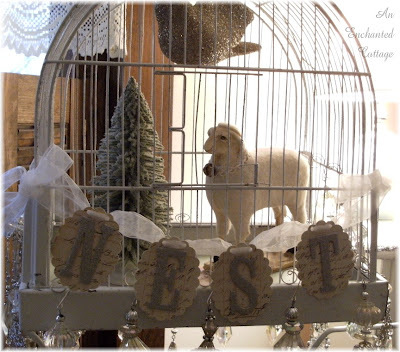 This precious fella would be a part of my decor year round! You sure do special things with a bird cage. I saw one at a decorating mall the other day, and passed it up. I'd better try and remember where it was and high tail it back there. Yours is very special! 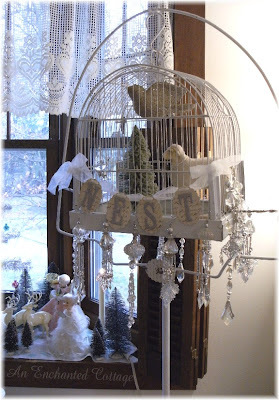 just found your blog, LOVE your tree, I thought I had a lot of decorations but you have about twice as many! Oooo that sheep is just precious! Love it all! It's a great job, unbelievable! I like your blog!, CONGRATULATIONS!